edit: looking at your solution to steel works, I just realized that for some reason I waaay over complicated things on my playthrough last night. For some reason I didn't think to use a blocker to turn the second lemming to build that stairway. I guess it's fun to have found a 1 blocker solution, but man what a crazy blindspot, haha! I guess I just thought since it's mayhem, the hardest thing I can think of must be the solution! There's actually a really evil trick on Steel Works, which was probably not intended. The initial fall is only fatal by one pixel, so you can simply make the first lemming float and immediately build to make it safe. Haha, that's interesting! I actually tried that in some other places, but never at the start, as I had already established that what I did there worked, and both times I tried it in another place, it didn't work. So I guess those falls are higher. At first I thought "No destructive skills?" and didn't get anywhere except into the flames... but then I realised there were destructive skills. I then solved it right away! Edit: It's Hero Time! is awesome! I really like that!! 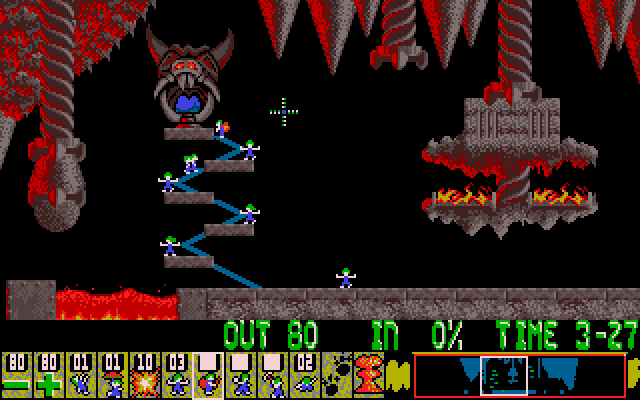 Edit 3: On my second try, though, I got just enough Lemmings in there! Interesting Solution there 607 for the boiler room level. The level tests you to see if you remember the (Call in the bomb squad) level. Well maybe it has a tiny element from that level in it. The levels that follow are quite tricky, (Down Along Up. In that order) When I first came across that one I was like oh no. Interesting Solution there 607 for the boiler room level. The level tests you to see if you remember the (Call in the bomb squad) level. Except that in the original game, level 1 of each rank is unlocked from the start, so there's no guarantee the player has seen Call in the bomb squad yet -- and indeed I remember that I completed Mayhem up to at least level 10 before getting that far in Taxing. Good point there Proxima. I think I done the same in that I played the first four or five levels of Mayhem before playing the harder taxing levels as they were further on. I have also started playing the Windows version, which is in my opinion quite inferior to the DOS version, but also rather unique, so it's nice to play regardless. And now I'll have to start in Fun again, which means I won't have to think. I wonder why there's the additional climber and floater, though. I've tried using them, but it wasn't really necessary, and made the timing more difficult. Edit: I think I'm missing something, as the execution seems too hard this way... let me think a little more about it. Edit 3: I did it! As you can see, and I was also trying in the attempt the previous screenshot shows, I reïmplemented my earlier idea of isolating a handful of Lemmings from the rest, for more precision. It was still tricky though, as there's so much to keep in mind, but on my last attempt before giving up for the time being, I did it! The next one (One Way or Another, hey, that's the name of that tune; it's a shame it doesn't play in this level in lem-fix3 ) looks fun! Am I right in thinking that this is not a repeat? The lay-out doesn't seem familiar. One way or another is a repeat of They just keep on coming (Tricky 9). Both levels can indeed be solved on either side. I didn't realise this when I was a kid, especially for the Mayhem version. I beat One way or another. I tried going around the left first, but I had issues with the one-way arrows, and with getting the crowd out. Going around the right, I didn't have these problems, and it was fairly easy to do. I also tried going underneath, but that seemed hopeless. Edit 2: I tried a variation of my strategy, letting the crowd move with the worker Lemming, but at the end had the same issue. However, I did get lucky that time. I've got another possible idea for making it not based on luck, but I'm not going to try it... I'm done anyway. And when I get here in the Windows version, I can simply use directional select. 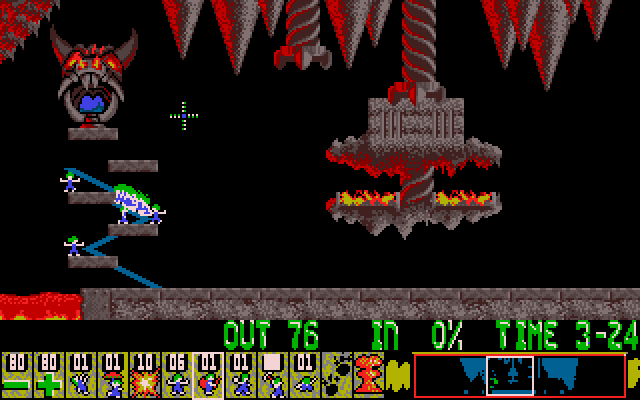 I used to find that level very hard in the past, I remember playing it on the atari st emulator and thinking to myself oh no not this level. Is it time for 607 to play lemmings. 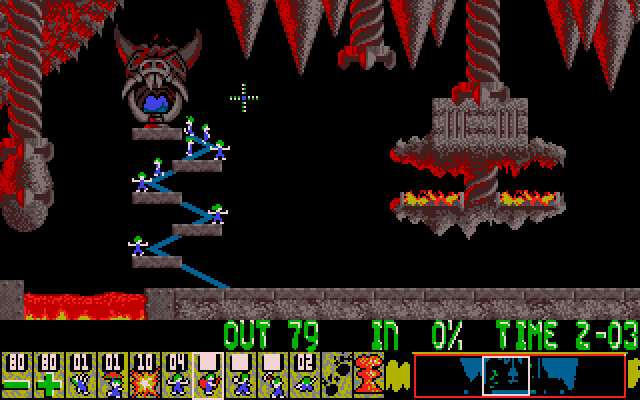 Today I got reminded of Lemmings three times in one evening, and had no plans for the rest of that evening. 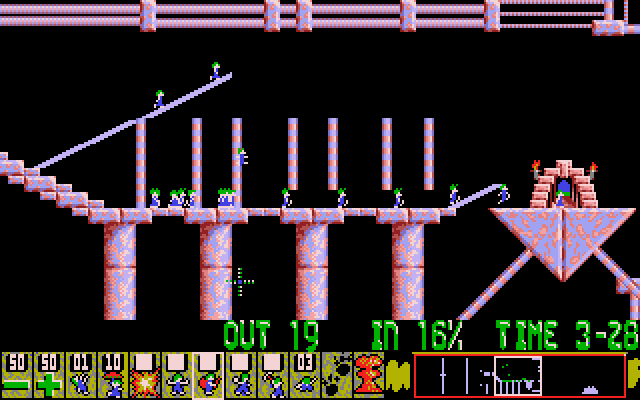 So yeah, now it's surely time to play Lemmings. I was going to attempt this on other levels as well, as it makes it more challenging and more fun, but the mechanics aren't working with me. I can not assign the left Lemming a basher, miner or digger in this position. 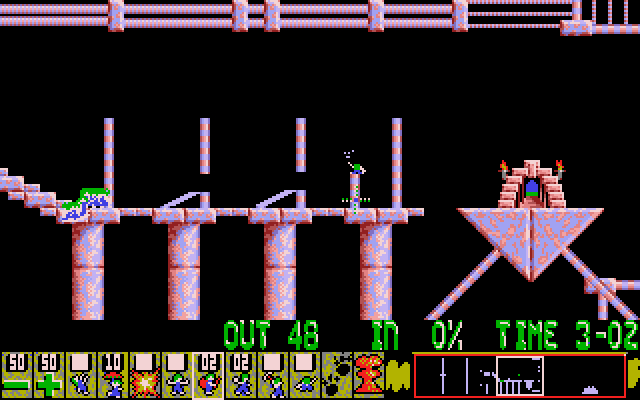 In the original Lemmings, you can free a blocker like this, right? Now that I had to redo it anyway, I did get it 100%, by placing the blocker in a more suitable spot.